Python is a great text-based language for beginning programmers because it is powerful but easy to learn and use. If you are ready to move from block-based to text-based programming, give it a try! 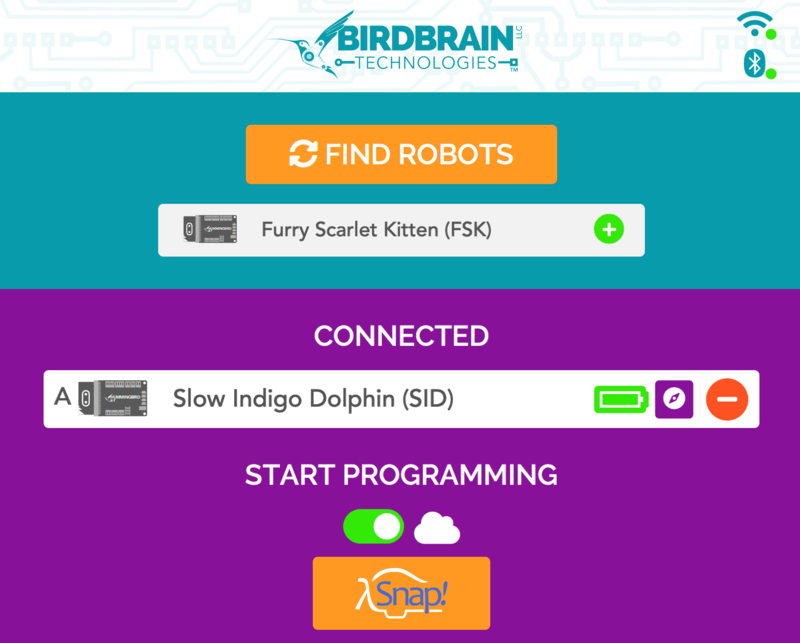 Our Python library allows students to use Python to read sensors and set motors and LEDs with the Hummingbird Bit. 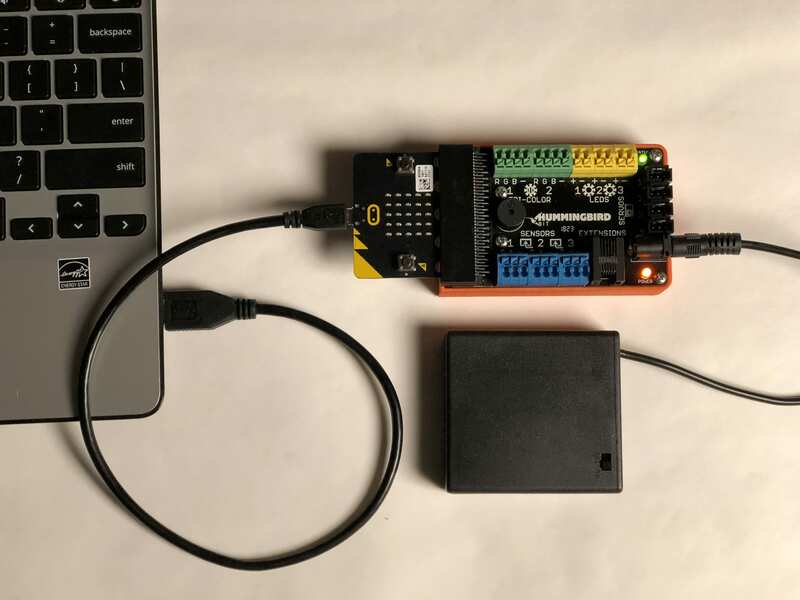 To use Python with the Hummingbird Bit, you must connect to the Hummingbird Bit via bluetooth with the BlueBird Connector. You will need a bluetooth dongle. Browser-based Python editors are not compatible with the Hummingbird Bit. You can use any offline Python editor with the Bit. If you don’t have a favorite, we suggest trying IDLE, which is an editor that is installed on your computer with Python. Now you are ready to start programming in Python! You can minimize the BlueBird Connector, but you should leave it open the entire time that you are using the Bit. 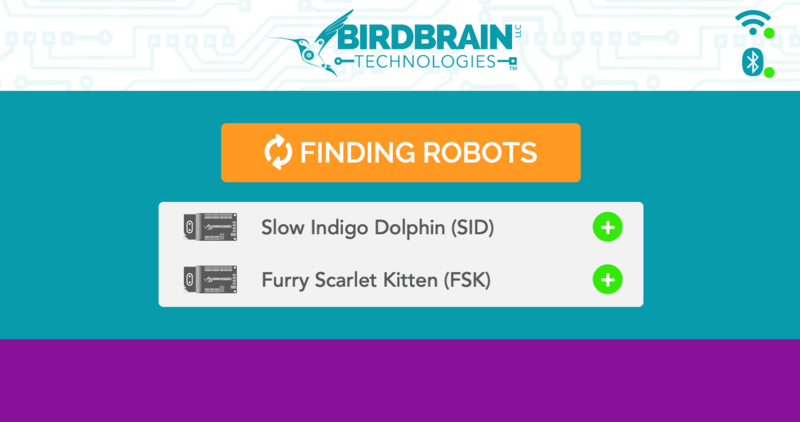 If at any point you have trouble with your robot, you should come back to the BlueBird Connector to check your bluetooth connection. You can also check your battery level in the BlueBird Connector. Start by installing Python. You can use any offline Python editor with the Hummingbird Bit. Browser-based Python editors are not compatible with the Bit. The screenshots here will show IDLE as an example; IDLE is an editor that is installed on your computer with Python. Download the Hummingbird Bit Python library. This folder contains the main library (HummingbirdBit.py) and a test file (HummingbirdTest.py). To test that everything is working properly, connect a single-color LED to port 1 of the Hummingbird. Then open HummingbirdTest.py in your IDE. To run the test program in IDLE, choose Run/Run Module. The single-color LED should blink 10 times. 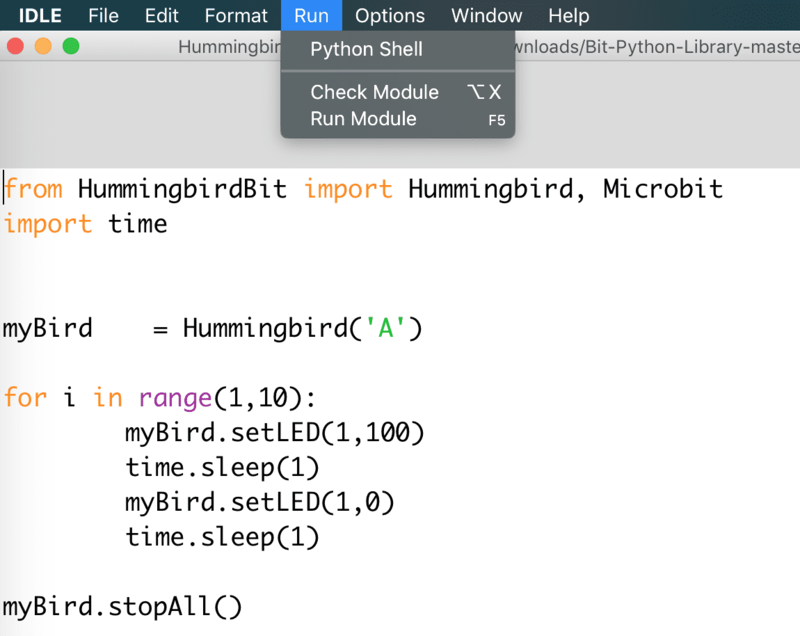 Now you are ready to start writing your own Python programs with the Hummingbird! These lessons will help you to get started, and this reference summarizes the functions that are available in the Hummingbird Python library. Make sure to store your programs in the HummingbirdPython folder so that they can find the Hummingbird library (HummingbirdBit.py). If you wish to store programs in a different folder, just make a copy of HummingbirdBit.py and move it to the desired folder.